Are you looking for a whirlwind weekend away this spring? Fancy experiencing one of Spain's most unforgettable festivals? 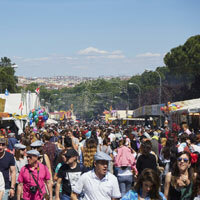 Why not head to Madrid and take in the spectacular Fiesta de San Isidro? The Fiesta de San Isidro (Festival of St Isidro) is one of Madrid's most popular and celebrated festivals, taking place over the course of five days in mid-May (11th-15th). San Isidro is the patron saint of the Spanish capital and the festival in his honour sees Madrid bring together ancient traditions and modern city life into one memorable party. Celebrations take place across the city, so wherever you stay you won't be far away from the action. However, festivities are focused around Plaza Mayor and the parks to the south-west of the centre, so the San Isidro district itself is a great place to base yourself. The hip Malasaña is ever popular with visitors, while the famous gay neighbourhood of Chueca is a great place for those searching for the heart of the action. No matter what your taste, there's always plenty to see at San Isidro. The main events range from religious ceremonies and plays to music festivals and concerts, so there's something for all ages. Wandering the streets, you'll see locals dancing chotis - Madrid's traditional dance - in the streets, while the city's elegant Retiro Park plays host to an impressive firework display on May 15th. It wouldn't be a Spanish festival without plenty of great food to eat and San Isidro is no exception. Traditional dishes include gallinejas (fried lamb intestines), or for something a little sweeter try barquillos (wafers topped with chocolate and whipped cream) and doughnut-like pastries called rosquillas. Although it might be tempting to try and take in everything during your San Isidro stay, try not to let yourself get too hung up on fitting everything in – you might just miss something great! The Spanish like to take things easy, so do as the locals do and simply go with the flow! If you're travelling to Madrid, it's essential you get the right cover for you. At World First, we offer dedicated travel insurance cover for families that'll give you peace of mind when enjoying the San Isidro celebrations.